Tucked away in north central Idaho, Coeur d'Alene is a destination that is often overlooked by those coming and going from Seattle or other parts of the American West. But, the city of 45,000 has a lot to offer visitors as well, including fine dining, local culture, and of course plenty of outdoor activities as well. With that in mind, here are our tips for what to see and do on an adventurous weekend in the area. Due to its out of the way location, getting to Coeur d'Alene can seem like an adventure all its own, although in reality it isn't especially difficult to get there. Most travelers fly into nearby Spokane, WA and rent a car for the 30 mile drive between the two cities, although some make the 300-mile trip from Seattle instead. Alternatively, travelers could also fly into Missoula, MT and drive 2.5 hours from there instead, although no major airlines fly into Cd'A directly. Each of these options use I-90 to access Coeur d'Alene. As an active mountain town, Coeur d'Alene is worth a visit anytime of the year. The available outdoor activities will vary based on the season of course, with hiking, mountain biking, and rafting popular in the summer, and skiing, snowboarding, and snowshoeing rising to the forefront in the winter. The busiest times of the year are June - August and December - March, which can make the town a bit more crowded and finding accommodations more difficult, but if you plan ahead, those challenges can be easily overcome too. • Whitewater Rafting on the Spokane River: Looking for a rush of adrenaline? Why not join locally-based ROW Adventures on a whitewater rafting excursion down the Spokane River?The company makes daily departures from June through September at reasonable rates for a 3.5 hour excursion on some impressive rapids. • Mountain Bike Farragut State Park: Hit the trail in nearby Farragut State Park, where visitors will find nearly 30 miles of trail to explore. Most of the routes are completely non-technical, with options for beginners and advanced riders alike. • Hike Mineral Ridge National Recreation Trail: Located just 20 minutes outside of town, the Mineral Ridge National Recreation Trail is a 3.3 mile loop that takes roughly 2-4 hour to hike, depending on how much of a workout you want and how often you stop to take in the very scenic views. Definitely one of the more visually stunning hikes in the area. 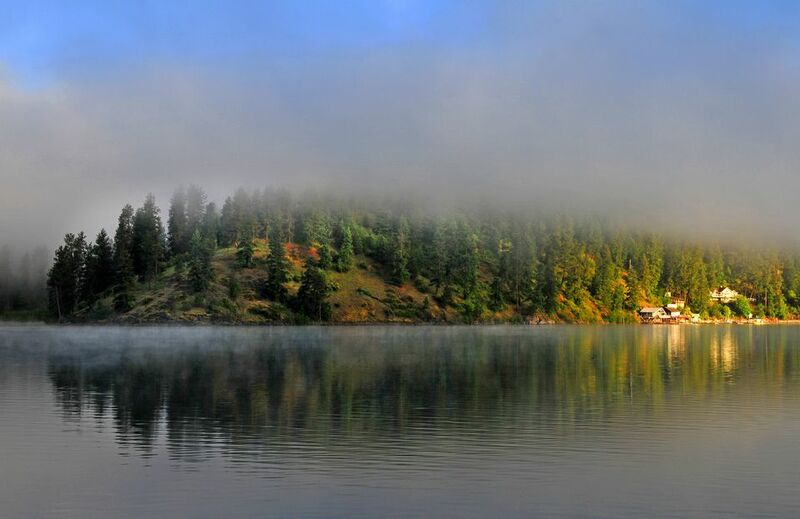 • Paddle Lake Coeur d'Alene: With more than 109 miles of shoreline, and plenty of hidden coves to explore, Lake Coeur d'Alene is a dream come true for kayakers. ROW Adventures takes guided tours out onto the lake or independent paddlers can rent boats from Kayak Coeur d'Alene and plot their own course. Either way, it is an amazing experience out on the water. • Go Ziplining: Timberline Adventures offers a fast and furious ride through the forests near town. The company's zipline experience features seven unique lines to ride, plus three sky bridges to walk as well. The views along the way are nothing short of spectacular, with some adrenaline inducing moments along the way as well. • Ski Silver Mountain: During the winter months, nearby Silver Mountain is an excellent option for skiers looking for plenty of snow (300 inches annually! ), but manageable crowds. The resort offers 70+ trails spread out over 1600 skiable acres, as well as a terrain park, tubing, and more. Despite its size, Cd'A has some surprisingly great options in terms of hotels, not the least of which is the Coeur d'Alene Resort itself. Situated right on Lake Coeur d'Alene, the resort features 338 rooms, several restaurants and bars, a spa, and more. The rooms are comfortable spacious, and luxurious, although there are some extremely upscale accommodations for those whose budget allows. There are plenty of other choices for visitors as well, including the usual chain hotels, mixed in with some locally owned options too. B&B's have been on the rise in recent years too, bringing a different kind of charm and appeal. For a rundown of all of the places to stay, visit coeurdalene.org. Coeur d'Alene is blessed with a number of fantastic eateries and visitors never have to worry about going hungry. The Midtown Bluebird is a local staple, with excellent menu that offers a wide variety of delicious options. Crafted is a tap house with more than 50 beers available and some of the best burgers around, while Le Peep is a perfect breakfast, brunch, or lunch spot right on the lake. For a truly unique experience, book dinner with Candle in the Woods. It's a short drive out of Cd'A, but you'll be escorted to and from town in your own personal limo. Dinner is served as a 7-10 course prix fixe menu with gourmet quality dishes that will leave you both highly satisfied and begging for more.